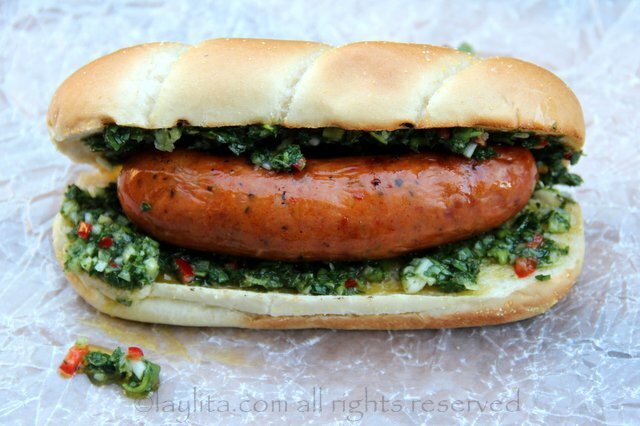 Choripan is a traditional Argentinean appetizer or snack consisting of grilled chorizo on bread topped with chimichurri sauce. 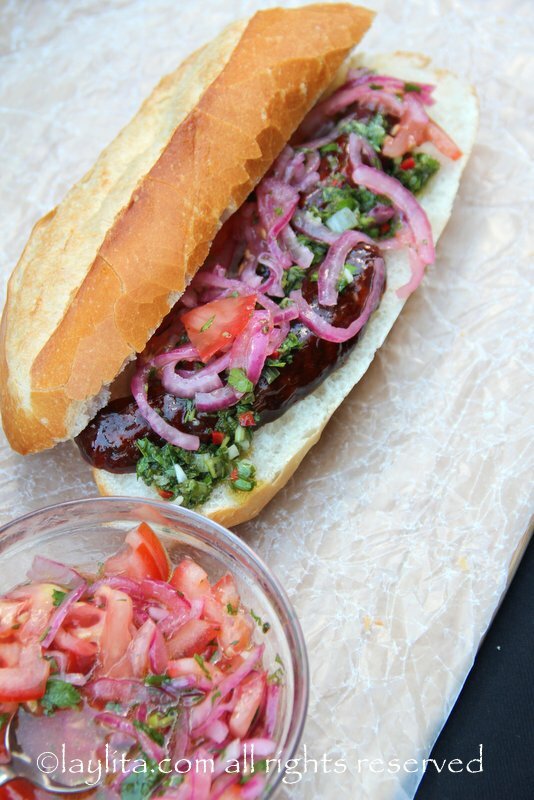 This flavorful chorizo sandwich, also called chori for short, is popular in many Latin American countries and is a must have for an asado or BBQ. 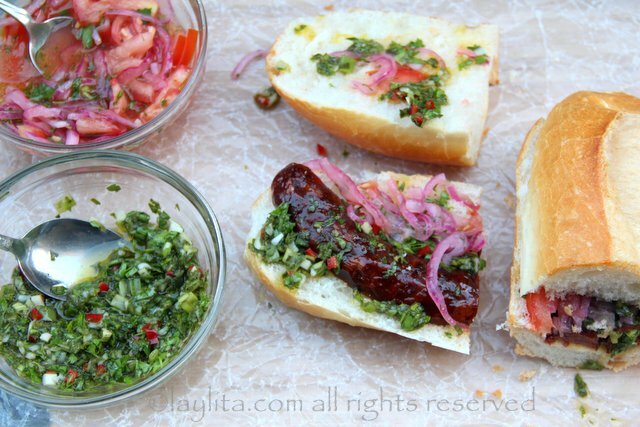 Choripanes or chorizo style hot dogs make a great appetizer or bite to snack while you are waiting for the main meal to be ready on the grill. 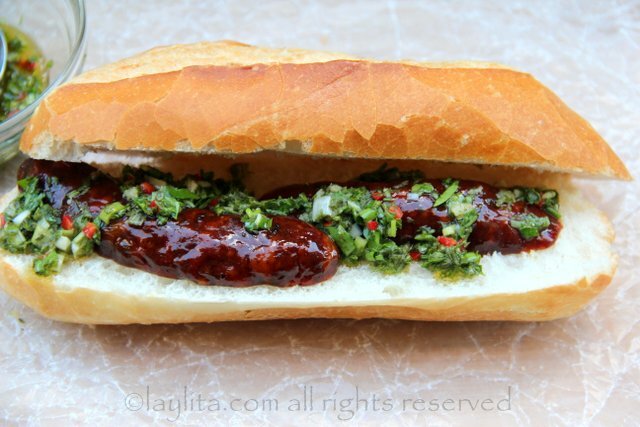 There’s nothing better when you are in that state of semi-starvation at a barbecue, and exposed to all these delicious grilling smells, than to snack on a bite of baguette stuffed with grilled chorizo and topped with some chimichurri sauce. 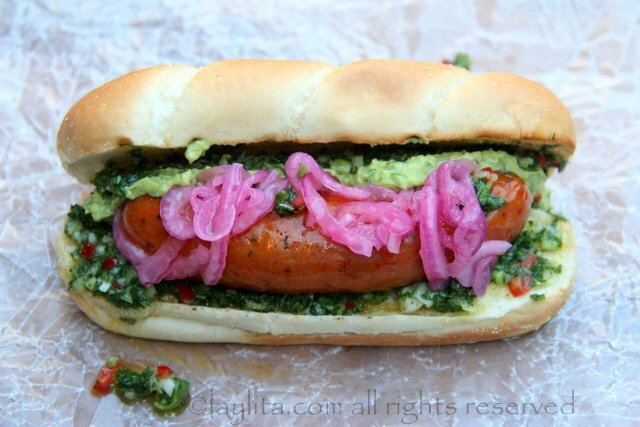 Of course, this chorizo hot dog can be served as delicious main meal. 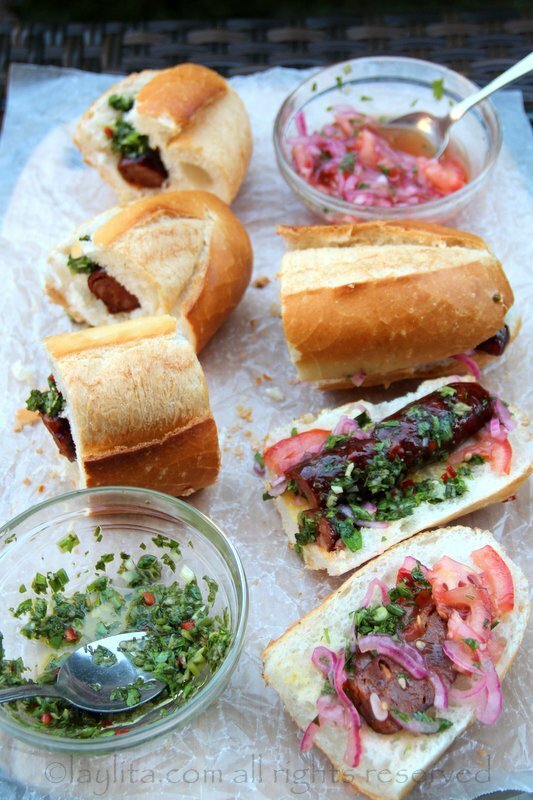 I like to think of choripan as the adult version of the hot dog – especially for those who love spicy flavors. 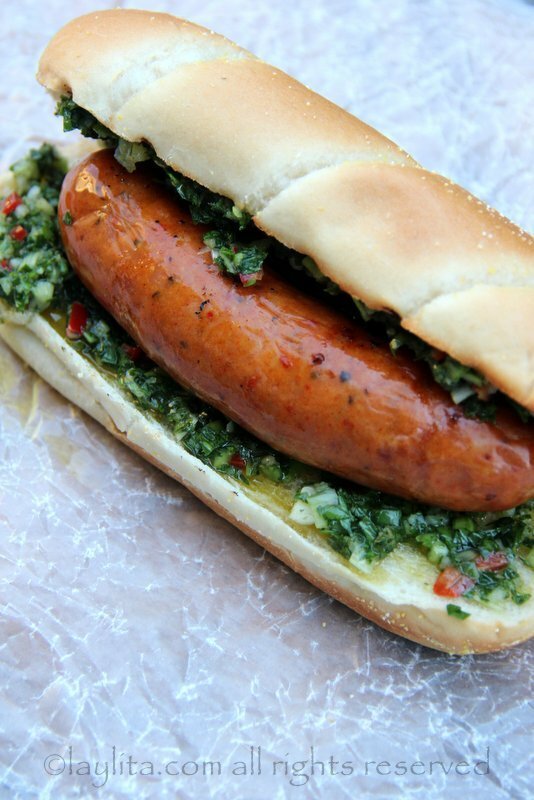 Choripan is a traditional Argentinean street food or BBQ style sandwich made with grilled chorizo and chimichurri sauce. 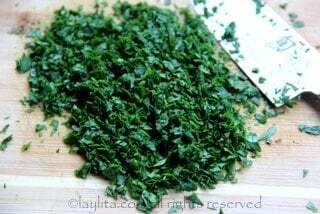 Combine all the ingredients together in a medium sized bowl and mix well. 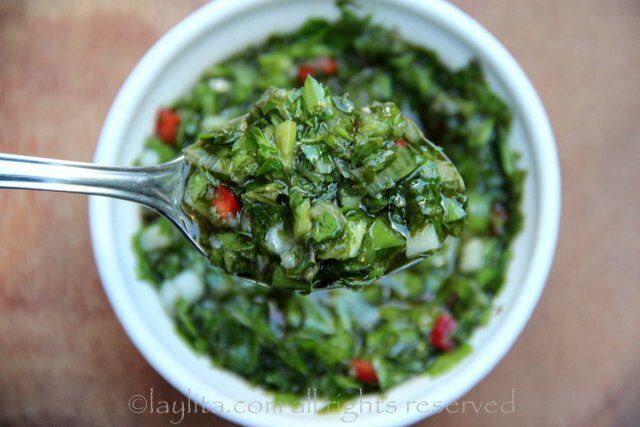 Can be made ahead of time and kept in the fridge until ready to use. 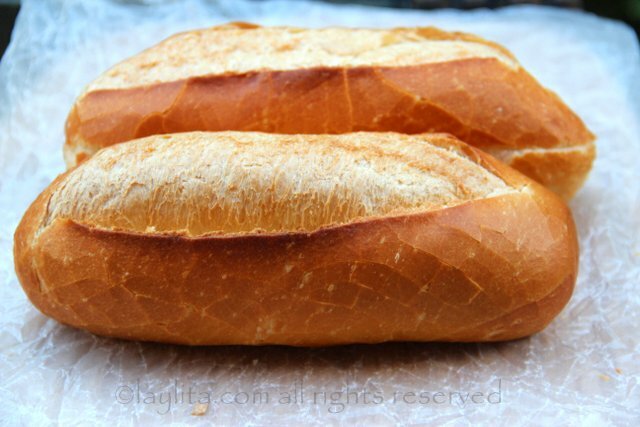 Cut the baguette or French rolls lengthwise and place (inside down) on the grill to lightly toast. 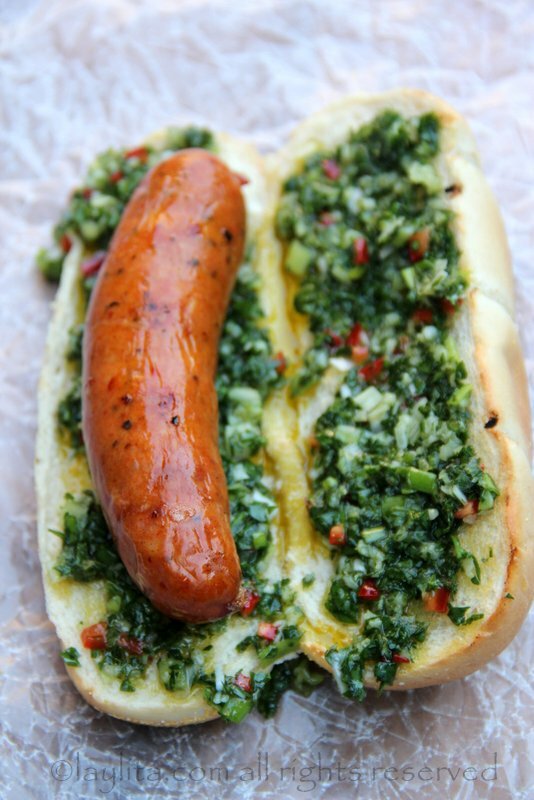 Place a tablespoon or more of chimichurri salsa on the baguette or hot dog bun, spread and then add the chorizo sausage. 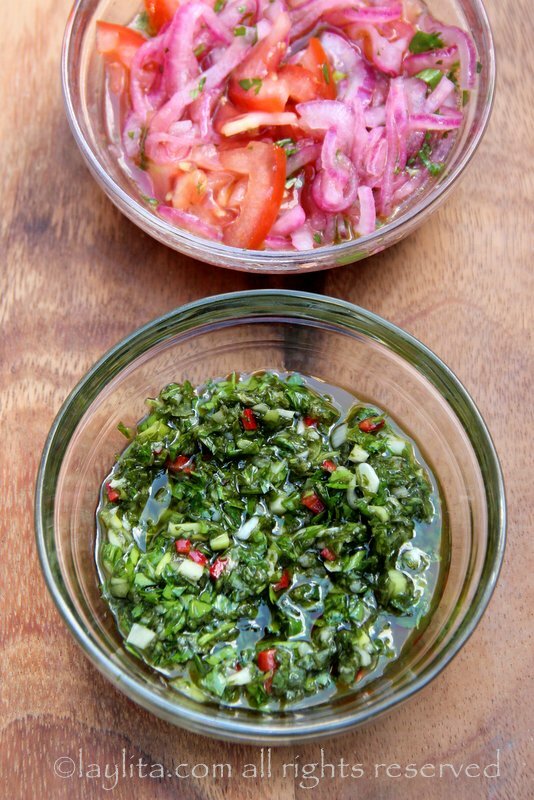 Top with additional chimichurri, tomato and onion curtido salsa, and guacamole. 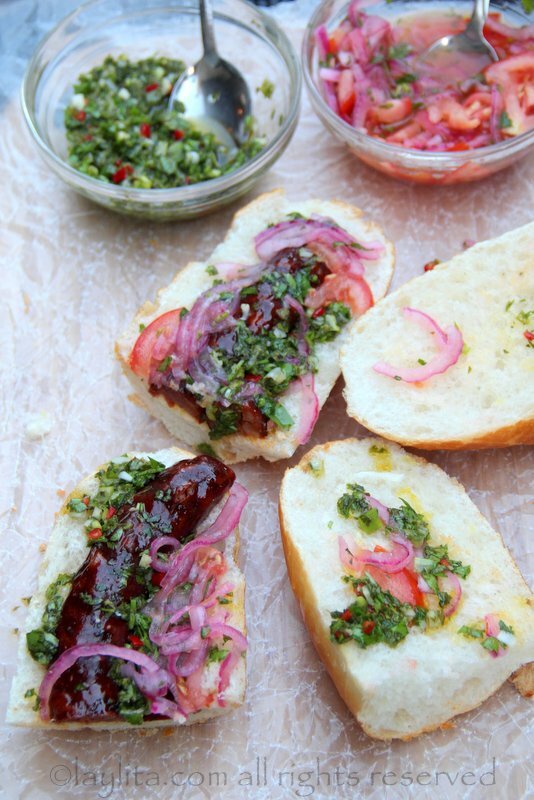 For bite size or smaller snacks, cut the chorizo and the bread into smaller pieces and serve with chimichurri and additional toppings. 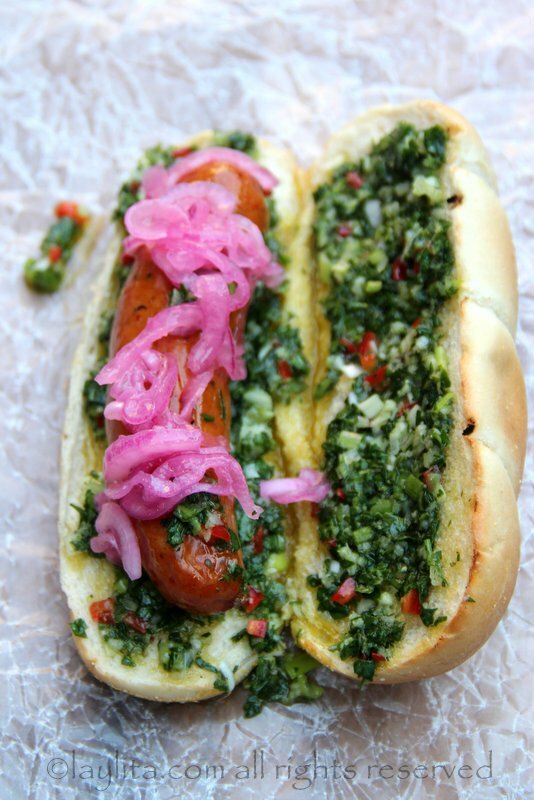 For a vegetarian version, you can make this using your favorite veggie sausage. 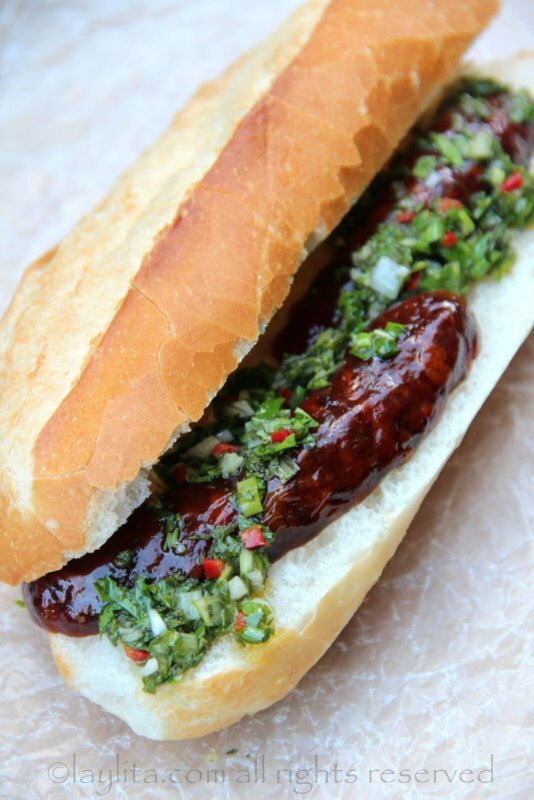 Chimichurri sauce is a must have for any choripan recipe; the most basic version of this popular Latin sandwich is bread, grilled chorizo and chimichurri salsa. 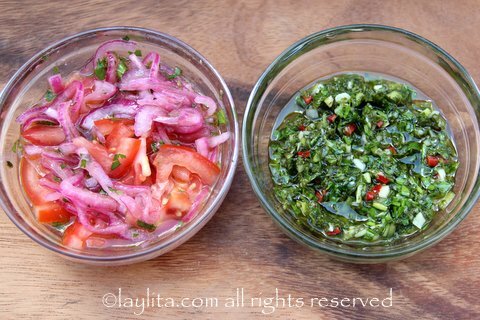 I also like serve them with onion curtido or pickled red onions or an onion and tomato curtido, a type of fresh salsa where the onion and tomato are marinated in a lime juice cilantro mix. 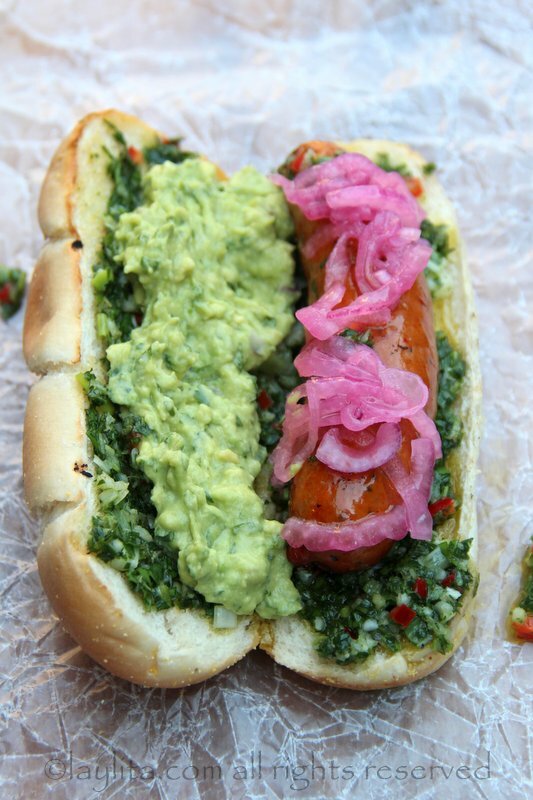 I am huge fan of eating everything with avocados or guacamole, so for Tex-Mex or Mexican twist to this South American hot dog, I recommend adding guacamole as another topping. 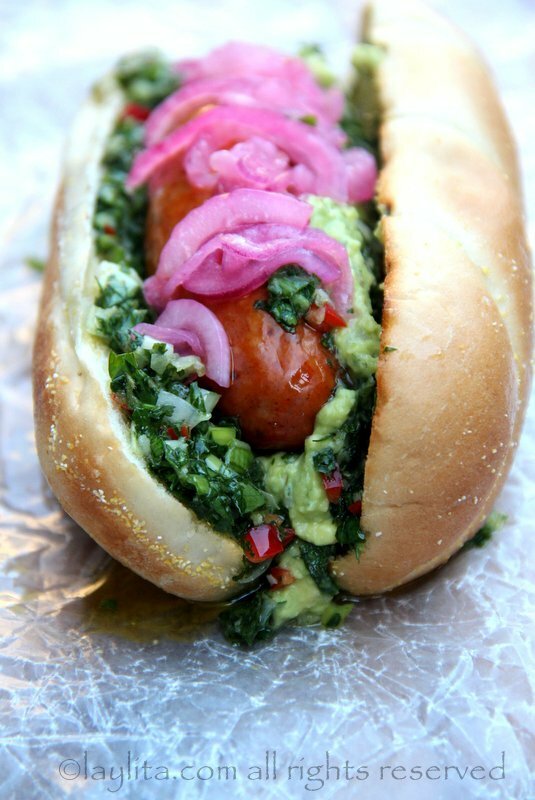 When you combine grilled chorizo on bread with chimichurri, pickled red onions and guacamole you get the the ultimate Latin hot dog. 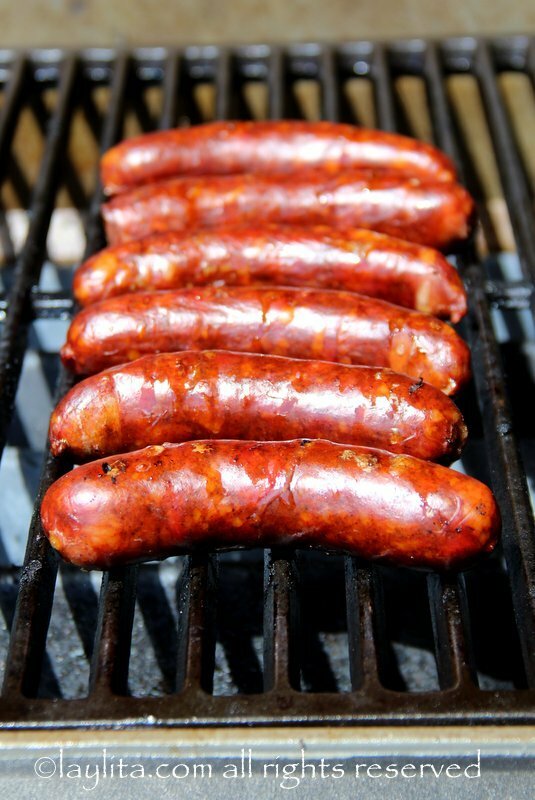 There are many types of chorizo, the best ones for choripan are the ones that come in casings and either soft or semi-soft. 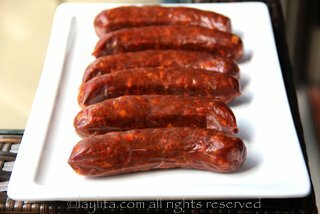 The hard cured Spanish chorizo isn’t suitable as it is too hard. 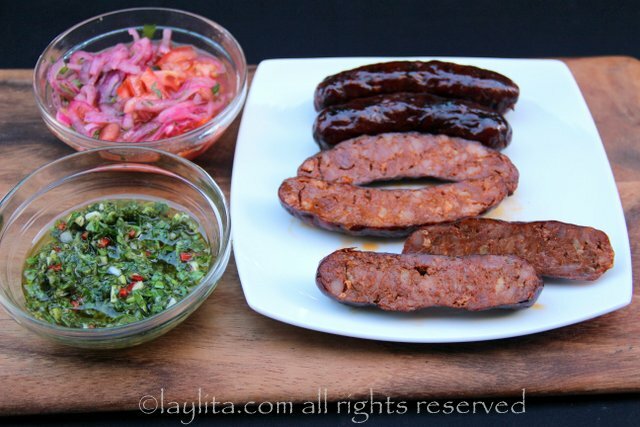 If you have access to a store that sells South American grocery products, you can also use longaniza. 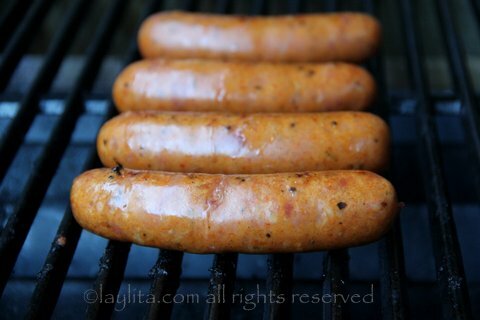 These days you can find chorizo in most US grocery stores, but in case you can’t find it you can also use those gourmet style sausages that are popular now. 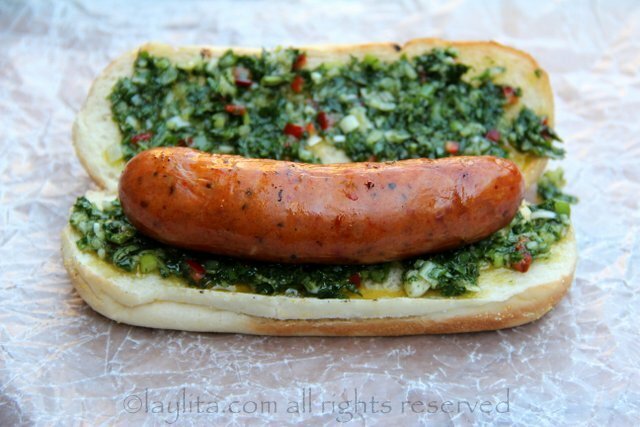 Or use good old regular hot dog sausages if you can’t find anything else. 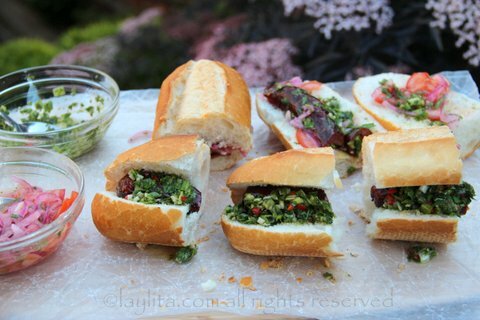 Of course, if I have vegetarian guests for a BBQ I like to make sure that I have some veggie sausages on hand – the flavor of the toppings will result in a delicious combination that even non-vegetarians will enjoy. 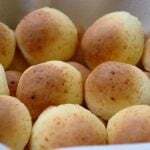 Baguette style bread is ideal for choripan, I like to use demi-baguettes, but good quality hot dog buns, French rolls, or even sandwich bread will work fine. 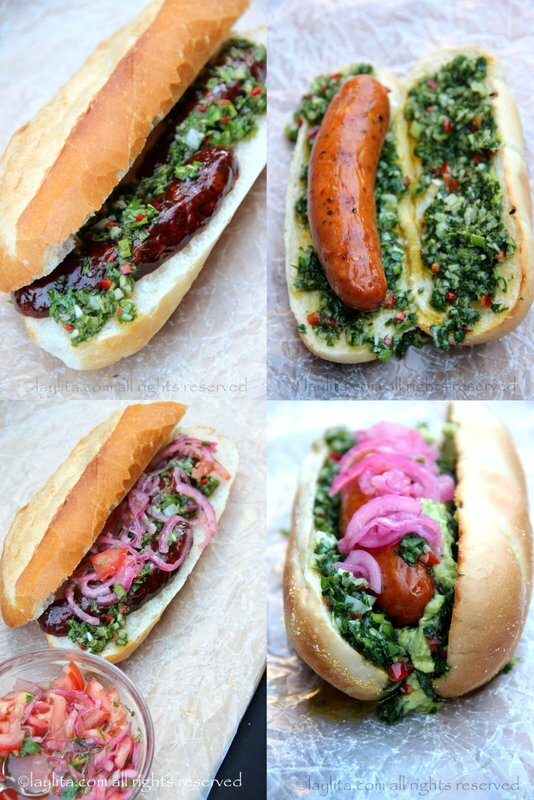 That Chorizo Hot Dog is simply TO DIE FOR!!! I will have a good reason to try this out buying some Chorizo. 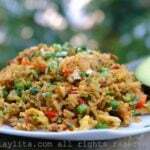 Hell can even try this with some Caribbean Green Seasoning too to add some variations.